SACRAMENTO, Calif. /California Newswire/ — This weekend Calif. Gov. 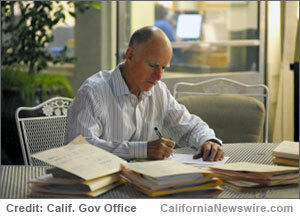 Brown signed a wide variety of senate and assembly bills into law, including: AB 169 by Assemblymember Brian Maienschein (R-San Diego) – Local government: public records: Internet. Also, AB 187 by Assemblymember Rob Bonta (D-Alameda) – Medi-Cal: managed care: California Children’s Services program. • AB 219 by Assemblymember Tom F. Daly (D-Anaheim) – Public works: concrete delivery. • AB 281 by Assemblymember James M. Gallagher (R-Nicolaus) – Collateral recovery. • AB 621 by Assemblymember Roger Hernández (D-West Covina) – Drayage truck operators: Motor Carrier Employer Amnesty Program. • AB 662 by Assemblymember Susan Bonilla (D-Concord) – Public accommodation: disabled adults: changing facilities. • AB 667 by Assemblymember Donald P. Wagner (R-Irvine) – Broker-dealers: exemptions: finders. • AB 848 by Assemblymember Mark Stone (D-Scotts Valley) – Alcoholism and drug abuse treatment facilities. • AB 852 by Assemblymember Autumn R. Burke (D-Inglewood) – Public works: prevailing wages. • AB 901 by Assemblymember Richard S. Gordon (D-Menlo Park) – Solid waste: reporting requirements: enforcement. • AB 990 by Assemblymember Susan Bonilla (D-Concord) – Political Reform Act of 1974: advertisement disclosures. • AB 1058 by Assemblymember Catharine Baker (R-Dublin) – Pupil safety: child abuse prevention: training. • AB 1182 by Assemblymember Miguel Santiago (D-Los Angeles) – Secondhand goods: tangible personal property. • AB 1292 by Assemblymember Matthew M. Dababneh (D-Encino) – Bank on California program. • AB 1303 by Assemblymember Adam Gray (D-Merced) – Subdivision Map Act: map expiration dates. • AB 1358 by Assemblymember Matthew M. Dababneh (D-Encino) – School facilities: design-build contracts. • AB 1431 by Assemblymember Jimmy Gomez (D-Los Angeles) – Local Agency Public Construction Act: job order contracting. • AB 1513 by Assemblymember Das G. Williams (D-Santa Barbara) – Employment: workers’ compensation and piece-rate compensation. • AB 1521 by the Committee on Judiciary – Disability access: construction-related accessibility claims. • AB 1544 by Assemblymember Ken Cooley (D-Rancho Cordova) – Political Reform Act of 1974: behested payments. • SB 21 by Senator Jerry Hill (D-San Mateo) – Political Reform Act of 1974: gifts of travel. • SB 27 by Senator Jerry Hill (D-San Mateo) – Livestock: use of antimicrobial drugs. A signing message can be found here. • SB 36 Senator Ed Hernandez (D-Azusa) – Medi-Cal: demonstration project. • SB 147 by Senator Ed Hernandez (D-Azusa) – Federally qualified health centers. • SB 197 by Senator Marty Block (D-San Diego) – Finance lenders: commercial loan: referral. • SB 219 by Senator Carol Liu (D-La Cañada Flintridge) – Prisons: alternative custody. • SB 239 by Senator Robert M. Hertzberg (D-Van Nuys) – Local services: contracts: fire protection services. • SB 361 by Senator Jerry Hill (D-San Mateo) – Antimicrobial stewardship: education and policies. • SB 413 by Senator Bob Wieckowski (D-Fremont) – Public transit: prohibited conduct. • SB 707 by Senator Lois Wolk (D-Davis) – Firearms: gun-free school zone. • AB 10 by Assemblymember Mike Gatto (D-Glendale) – Political Reform Act of 1974: economic interest disclosures. A veto message can be found here. • AB 50 by Assemblymember Kevin Mullin (D-South San Francisco) – Medi-Cal: evidence-based home visiting programs. A veto message can be found here. • AB 68 by Assemblymember Marie Waldron (R-Escondido) – Medi-Cal. A veto message can be found here. • AB 80 by Assemblymember Nora Campos (D-San Jose) – Interagency Task Force on the Status of Boys and Men of Color. A veto message can be found here. • AB 141 by Assemblymember Susan Bonilla (D-Concord) – Teacher credentialing: beginning teacher induction programs. A veto message can be found here. • AB 172 by Assemblymember Freddie Rodriguez (D-Pomona) – Emergency departments: assaults and batteries. A veto message can be found here. • AB 182 by Assemblymember Luis Alejo (D-Watsonville) – California Voting Rights Act of 2001. A veto message can be found here. • AB 483 by Assemblymember Jim Patterson (R-Fresno) – Healing arts: license fees: proration. A veto message can be found here. • AB 562 by Assemblymember Chris Holden (D-Pasadena) – Elections: ballots. A veto message can be found here. • AB 676 by Assemblymember Ian C. Calderon (D-Whittier) – Employment: discrimination: status as unemployed. A veto message can be found here. • AB 706 by Assemblymember Susan Bonilla (D-Concord) – CaliforniaVolunteers. A veto message can be found here. • AB 745 by Assemblymember Ed Chau (D-Arcadia) – Mental Health Services Oversight and Accountability Commission. A veto message can be found here. • AB 787 by Assemblymember Roger Hernández (D-West Covina) – Charter schools: operation: nonprofit public benefit corporations: for-profit corporation prohibition. A veto message can be found here. • AB 858 by Assemblymember Jim Wood (D-Healdsburg) – Medi-Cal: federally qualified health centers and rural health clinics. A veto message can be found here. • AB 861 by Assemblymember Brian Maienschein (R-San Diego) – Mental health: community-based services. A veto message can be found here. • AB 883 by Assemblymember Evan Low (D-Campbell) – Employment: public employee status. A veto message can be found here. • AB 1031 by Assemblymember Tony Thurmond (D-Richmond) – Public Employees’ Medical and Hospital Care Act: contracting entities. A veto message can be found here. • AB 1162 by Assemblymember Chris Holden (D-Pasadena) – Medi-Cal: tobacco cessation. A veto message can be found here. • AB 1231 by Assemblymember Jim Wood (D-Healdsburg) – Medi-Cal: nonmedical transportation. A veto message can be found here. • AB 1261 by Assemblymember Autumn R. Burke (D-Inglewood) – Community-based adult services: adult day health care centers. A veto message can be found here. • AB 1301 by Assemblymember Reginald Byron Jones-Sawyer Sr. (D-Los Angeles) – Voting rights: preclearance. A veto message can be found here. • AB 1342 by Assemblymember Marc Steinorth (R-Rancho Cucamonga) – Disability access. A veto message can be found here. • SB 119 by Senator Jerry Hill (D-San Mateo) – Protection of subsurface installations. A veto message can be found here. • SB 292 by Senator Richard Pan (D-Sacramento) – Public employee retirement: contributions. A veto message can be found here. • SB 599 by Senator Tony Mendoza (D-Artesia) – Employment: public transit service contracts. A veto message can be found here. • SB 610 by Senator Richard Pan (D-Sacramento) – Medi-Cal: federally qualified health centers: rural health clinics: managed care contracts. A veto message can be found here. • SB 686 by Senator Richard Pan (D-Sacramento) – Public postsecondary education: Higher Education Employer-Employee Relations Act. A veto message can be found here. • AB 30 by Assemblymember Luis Alejo (D-Watsonville) – School or athletic team names: California Racial Mascots Act. • AB 199 by Assemblymember Susan Talamantes Eggman (D-Stockton) – Alternative energy: recycled feedstock. • AB 216 by Assemblymember Cristina Garcia (D-Bell Gardens) – Product sales to minors: vapor products. • AB 229 by Assemblymember Ling-Ling Chang (R-Diamond Bar) – State employees: travel reimbursement. • AB 306 by Assemblymember David Hadley (R-Manhattan Beach) – Public schools: attendance alternatives: children of military personnel. • AB 379 by Assemblymember Richard S. Gordon (D-Menlo Park) – Foster youth: homeless children or youth: complaint of noncompliance: exemption from local graduation requirements. • AB 403 by Assemblymember Mark Stone (D-Scotts Valley) – Public social services: foster care placement: funding. • AB 449 by Assemblymember Jacqui V. Irwin (D-Thousand Oaks) – Income taxation: savings plans: Qualified ABLE Program. • AB 506 by Assemblymember Brian Maienschein (R-San Diego) – Limited liability companies. • AB 525 by Assemblymember Chris Holden (D-Pasadena) – Franchise relations: renewal and termination. • AB 604 by Assemblymember Kristin M. Olsen (R-Modesto) – Electrically motorized boards. • AB 679 by Assemblymember Travis Allen (R-Huntington Beach) – Controlled substances. • AB 768 by Assemblymember Tony Thurmond (D-Richmond) – Smokeless tobacco: baseball stadiums. • AB 786 by Assemblymember Marc B. Levine (D-San Rafael) – Common interest developments: property use and maintenance. • AB 854 by Assemblymember Shirley N. Weber (D-San Diego) – Educational services: pupils in foster care. • AB 963 by Assemblymember Susan Bonilla (D-Concord) – Teachers’ Retirement Law. • AB 970 by Assemblymember Adrin Nazarian (D-Sherman Oaks) – Labor Commissioner: enforcement of employee claims. • AB 1073 by Assemblymember Philip Y. Ting (D-San Francisco) – Pharmacy: prescription drug labels. • AB 1134 by Assemblymember Mark Stone (D-Scotts Valley) – Firearms: concealed firearm licenses. • AB 1185 by Assemblymember Sebastian Ridley-Thomas (D-Los Angeles) – Los Angeles Unified School District: best value procurement: pilot program. • AB 1230 by Assemblymember Jimmy Gomez (D-Los Angeles) – California Americans With Disabilities Small Business Capital Access Loan Program. • AB 1269 by Assemblymember Matthew M. Dababneh (D-Encino) – Alternative energy. • AB 1277 by Assemblymember William P. Brough (R-Dana Point) – Tax administration: Taxpayers’ Rights Advocate: levy or notice to withhold: return of funds. • AB 1350 by Assemblymember Rudy Salas Jr. (D-Bakersfield) – Kern County Hospital Authority. • AB 1422 by Assemblymember Jim Cooper (D-Elk Grove) – Transportation network companies. • AB 1509 by Assemblymember Roger Hernández (D-West Covina) – Employer liability. • SB 63 by Senator Isadore Hall III (D-Compton) – Seaport infrastructure financing districts. • SB 221 by Senator Hannah-Beth Jackson (D-Santa Barbara) – State public employees: sick leave: veterans with service-related disabilities. • SB 272 by Senator Robert M. Hertzberg (D-Van Nuys) – The California Public Records Act: local agencies: inventory. • SB 324 by Senator Fran Pavley (D-Agoura Hills) – Income taxation: savings plans: Qualified ABLE Program. • SB 326 by Senator Jim Beall (D-San Jose) – Courts: penalties: emergency services funding. • SB 343 by Senator Loni Hancock (D-Berkeley) – Corrections: inmates. • SB 494 by Senator Jerry Hill (D-San Mateo) – Emergency services: seismic safety and earthquake-related programs. • SB 501 by Senator Bob Wieckowski (D-Fremont) – Wage garnishment restrictions. • SB 546 by Senator Mark Leno (D-San Francisco) – Health care coverage: rate review. • SB 579 by Senator Hannah-Beth Jackson (D-Santa Barbara) – Employees: time off. • SB 588 by Senator Kevin de León (D-Los Angeles) – Employment: nonpayment of wages: Labor Commissioner: judgment enforcement. • SB 641 by Senator Bob Wieckowski (D-Fremont) – Debt buying: default judgment. • SB 731 by Senator Mark Leno (D-San Francisco) – Foster children: housing: gender identity. • SB 770 by Senator Tony Mendoza (D-Artesia) – Department of Food and Agriculture: medicated feed. • SB 792 by Senator Tony Mendoza (D-Artesia) – Day care facilities: immunizations: exemptions. • AB 159 by Assemblymember Ian C. Calderon (D-Whittier) – Investigational drugs, biological products, and devices. A veto message can be found here. • AB 193 by Assemblymember Brian Maienschein (R-San Diego) – Mental health: conservatorship hearings. A veto message can be found here. • AB 332 by Assemblymember Ian C. Calderon (D-Whittier) – Long-term care insurance. A veto message can be found here. • AB 340 by Assemblymember Shirley N. Weber (D-San Diego) – Postsecondary education: campus climate: report. A veto message can be found here. • AB 371 by Assemblymember Kevin Mullin (D-South San Francisco) – CalWORKs Family Unity Act of 2015. A veto message can be found here. • AB 376 by Assemblymember Patty Lopez (D-San Fernando) – CalWORKs eligibility: immunizations. A veto message can be found here. • AB 465 by Assemblymember Roger Hernández (D-West Covina) – Contracts against public policy. A veto message can be found here. • AB 521 by Assemblymember Adrin Nazarian (D-Sherman Oaks) – HIV testing. A veto message can be found here. • AB 578 by Assemblymember Evan Low (D-Campbell) – Occupational safety and health. A veto message can be found here. • AB 967 by Assemblymember Das G. Williams (D-Santa Barbara) – Postsecondary education: sexual assault cases. A veto message can be found here. • AB 1017 by Assemblymember Nora Campos (D-San Jose) – Employers. A veto message can be found here. • AB 1279 by Assemblymember Chris Holden (D-Pasadena) – Music therapy. A veto message can be found here. • AB 1293 by Assemblymember Chris Holden (D-Pasadena) – State public employment: labor negotiations. A veto message can be found here. • AB 1347 by Assemblymember David S. Chiu (D-San Francisco) – Public contracts: claims. A veto message can be found here. • AB 1354 by Assemblymember Bill Dodd (D-Napa) – Discrimination: equal pay: state contracting. A veto message can be found here. • SB 406 by Senator Hannah-Beth Jackson (D-Santa Barbara) – Employment: leave. A veto message can be found here. • SB 475 by Senator William W. Monning (D-Carmel) – Continuing care contracts: cancellation: payments. A veto message can be found here. • SB 539 by Senator Steve Glazer (D-Contra Costa) – Public property: names: Confederate States of America. A veto message can be found here. • SB 548 by Senator Kevin de León (D-Los Angeles) – Child care: family child care providers: orientation training. A veto message can be found here. • SB 682 by Senator Mark Leno (D-San Francisco) – Courts. A veto message can be found here.